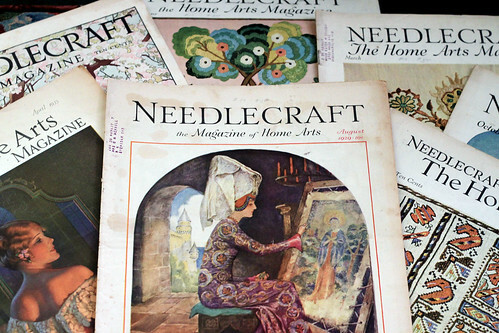 The current issue of “Piecework” magazine has an article on “Needlecraft the Magazine of Home Arts”. I have 7 issues dated between 1928 and 1935 that I picked up in the 1980’s at an antique mall in Indianapolis. They had lots of these magazines, but I only bought ones with crochet patterns I liked. The shop owner said they were mostly being sold to people who wanted to cut them up for the Campbell soup ads. Many of the issues were probably lost. Now I wish I had bought more. At that time we were just married and money was tight. I remember spending quite a bit of time going through them all over and over and deciding on which ones I could use and afford. 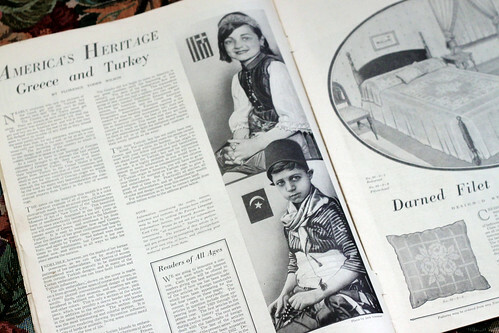 The Piecework article mentions the Greek girl and Turkish boy photos but didn’t include the photos. So here they are. There was some controversy of putting the two photos on the same page since the countries were currently at war. I did make up one pattern. 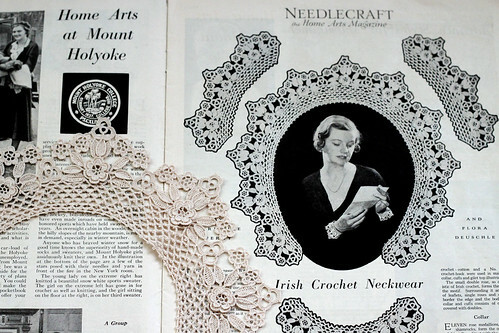 Here is the article and the collar I crocheted in size 100 thread. It was my first real thread crochet project and some of the leaves are twisted at the base. I remember that bothering me, now not so much. I think the blocking may have helped hide the twists. Wishing everyone a Wonderful and Creative week! This entry was posted on Wednesday, January 9th, 2013 at 6:38 pm and is filed under Craft, Crochet, Lace, Needlework and Vintage. Tagged: Craft, Crochet, Needlework. You can feed this entry. You can leave a response, or trackback from your own site. The crochet collar is beautiful! Very fine detailed work. Love the graphics and all the ads in Needlecraft too – fun reading. Gorgeous thread work on that collar – love the detail – you have the gift!! !